In November 2014 Gallery Oldham presented Art Detective with a mystery. The Lees sisters were daughters of Charles Lees, a significant industrialist in Oldham in the 1800s. They had a double portrait painted but the attribution of the work had been lost over the years. On Your Paintings and in the Gallery’s own records it was listed under ‘unknown artist’. The first comment on the discussion suggested the work could be by James Cadenhead, due to the way he painted chins. Martin Hopkinson agreed with Simon Carter, who suggested the aforementioned artist. The background to Charles Lees was explained further by Barbara Bryant, noting that Lees was a prominent collector and benefactor of the arts in Oldham. Marjory, who is depicted in this work, became a prominent suffragette and President of the Oldham Women’s Suffrage Society. The dress in the portrait was commented on by Lou Taylor and through examining the dress the painting was dated at around 1889 to 1892. Barbara Bryant requested that the Gallery look at the back of the painting. Initially the Gallery thought that the back of the painting had been checked, as it was well-used in exhibitions and displayed, however when the painting was taken off the wall it was discovered that it had been re-backed fairly recently and so the collection removed the backboard to find a label confirming it is by T. Blake Wirgman. 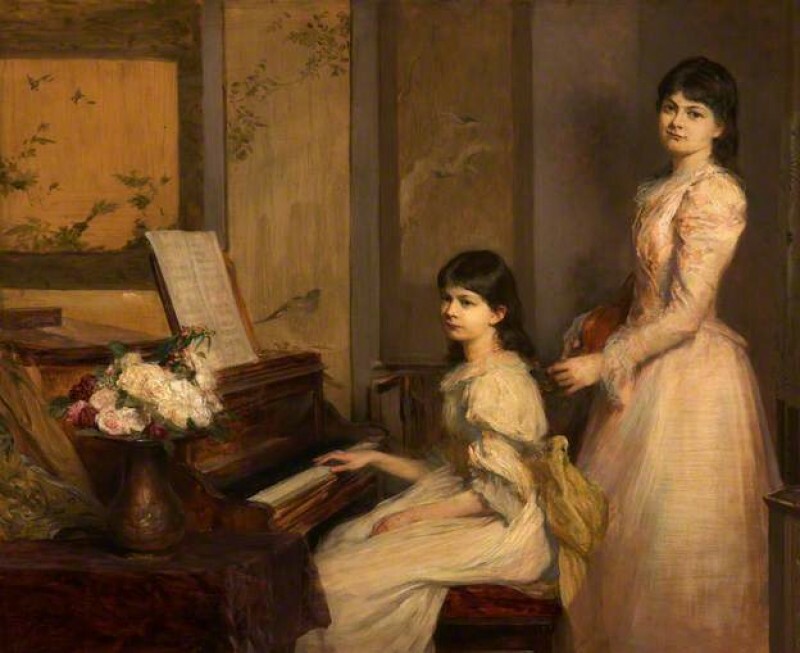 The artist was amended to Theodore Blake Wirgman, and the execution date of c.1891–1892 was added, which coincides with the sisters’ age and dress. Once the painting was identified Andrea Kollman found it was shown at the exhibition of The Society of Portrait Painters in June 1892. Editor’s note: These changes will appear on the Your Paintings website by early March 2015.
Who painted Dorothy and Marjory Lees?